Now that M’s getting older and walking more, we’re starting to use the big pram a little less. At the moment, B is tiny enough that it’s easy to pop her in a sling or carrier like the BabyBjörn Baby Carrier One and feel like I’m barely carrying anything at all, so it’s nice to have that sense of freedom. However, M has only just turned two, so her little legs tire easily and I can’t carry both of them. So, I’ve been looking around for a more compact pushchair that doesn’t take up the whole boot of our car. With that in mind, I was thrilled when we were sent the Quinny Zapp Flex Plus. 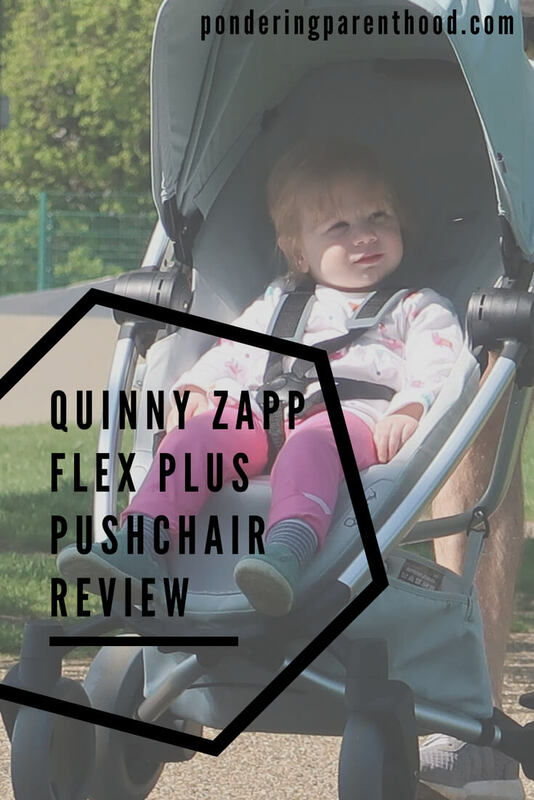 Without further ado, here is my Quinny Zapp Flex Plus review! The Quinny Zapp Flex Plus is a great option for a more compact pushchair. My favourite features at the closed pushbar, for easy one-handed pushing (I rarely seem to have two hands on the pushbar, so this is a must for me!) and the easy-access shopping basket. For me, a basket is an absolute essential on a pushchair. Often, they don’t seem to be included on the more compact designs. The basket on the Quinny Zapp Flex Plus is clever. It’s fabric, so folds easily, but has high sides to stop things falling out. It’s also great for storing the rain cover that comes as standard – something else that isn’t often included with other brands. 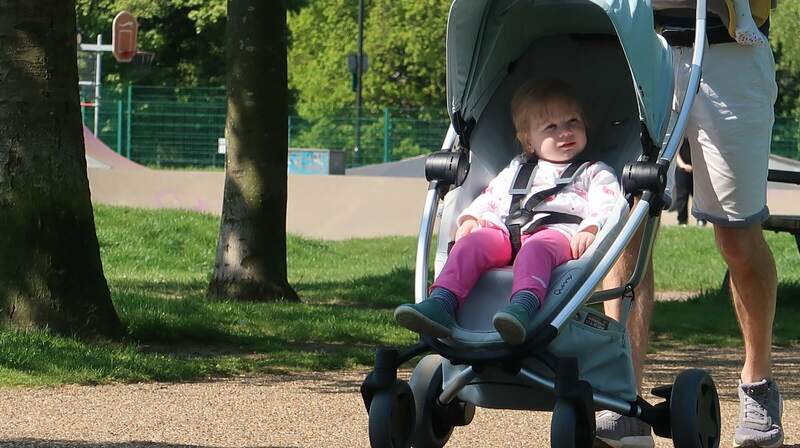 In fact, the Quinny Zapp Flex Plus has other features that you’d expect from a larger pram, while still being a compact option. 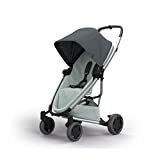 For example, it has four good-size, swivel wheels that make it an absolute dream to push, and a large, extendable sun canopy to keep your toddler protected from the sun’s rays. Not only that, but it includes Maxi-Cosi car seat adaptors as standard, which makes it a great option for the school run if you quickly need to whizz the baby out of the car and up to the school gate. 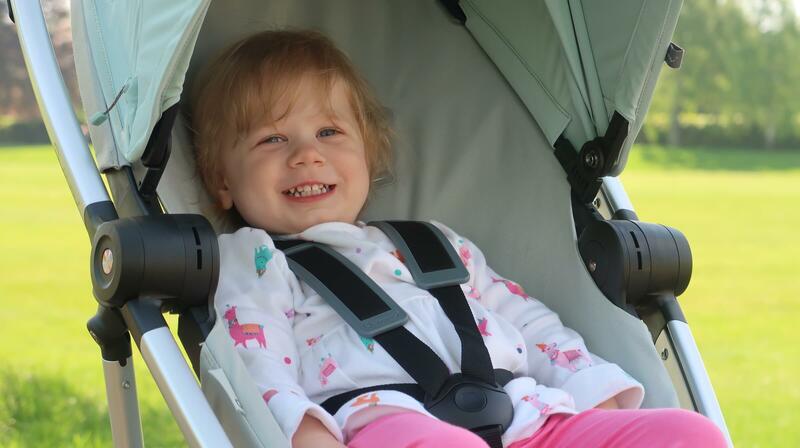 We tried out our Maxi-Cosi Pebble Plus car seat with the Quinny base and found the adaptors really easy to fit and use. 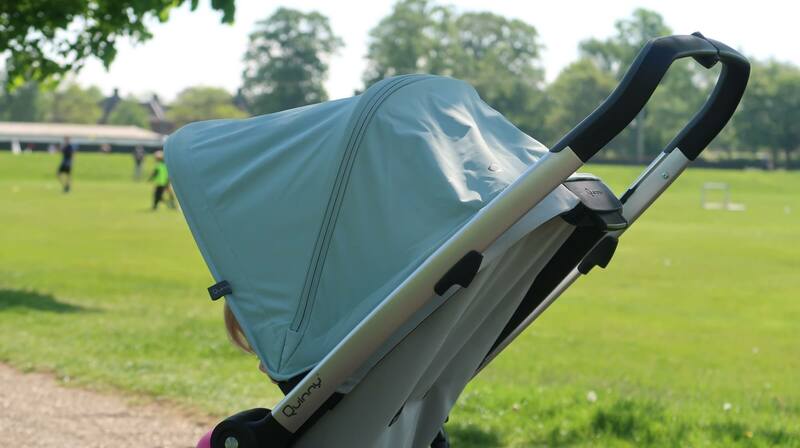 The Quinny Zapp Flex Plus has a very compact fold. It takes up around 1/3 of the boot space of our Ford Kuga. 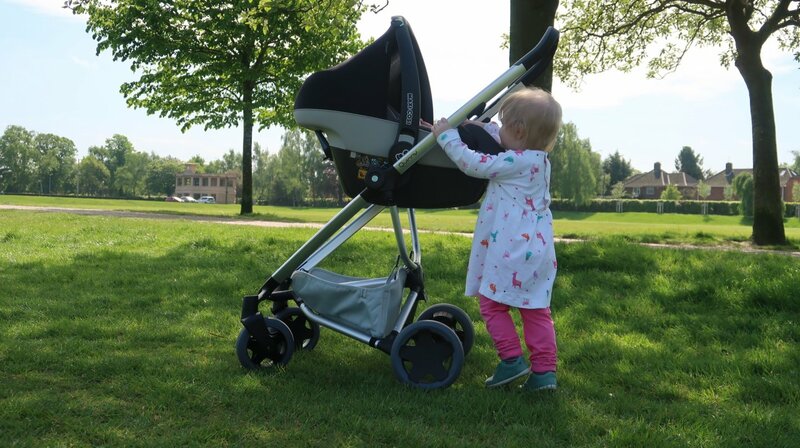 While it cannot boast a one-handed fold (it takes two hands and three steps to put the Quinny up and down), it does have a transport lock, which means that it clicks reassuringly into place when you’re putting it up. Despite the fold not being one-handed, it is pretty straightforward once you get the hang of it. Another thing I love about the Quinny Zapp Flex Plus is that the water-resistant, wipeable fabrics come in a range of really lovely colours. As well as the standard black, it comes in funkier colourways such as pink on blush and green on graphite. We chose to review the frost on grey option, which I think is the perfect choice for spring/summer. 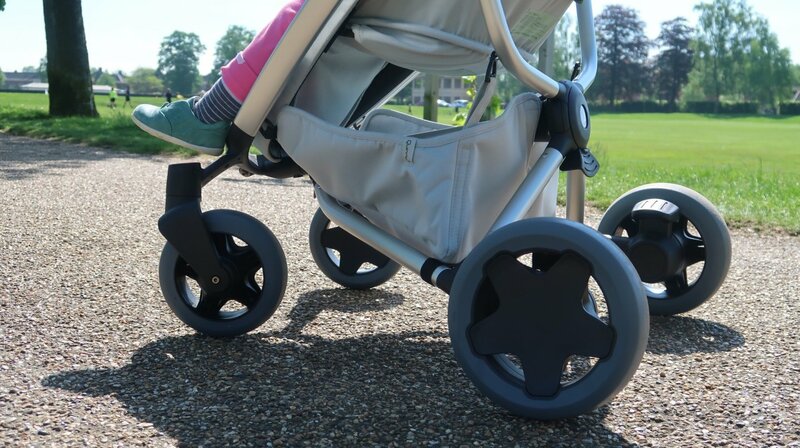 As well as all of the above that comes as standard, the Quinny Zapp Flex Plus comes with a wide range of options, which make it useable from birth. These include a Lux Carrycot, From-Birth Cocoon and a colour-coordinated Maxi-Cosi car seat. This is really clever as it makes a great option for city dwellers or those with small cars who want something super compact that they can use from birth. I really like the sturdiness of the Quinny Zapp Flex Plus. The materials feel high quality and the five point harness is easy to adjust. It feels like a high quality product. While the three-step fold gets a little bit of getting used to, it isn’t difficult, and overall I really like the design. I love the fact that there’s a basket and that the rain cover comes as standard. Coupled with the Maxi-Cosi adaptors, it feels like you’re getting more than just a compact stroller. The Quinny pushes really nicely, aided by the closed pushbar. 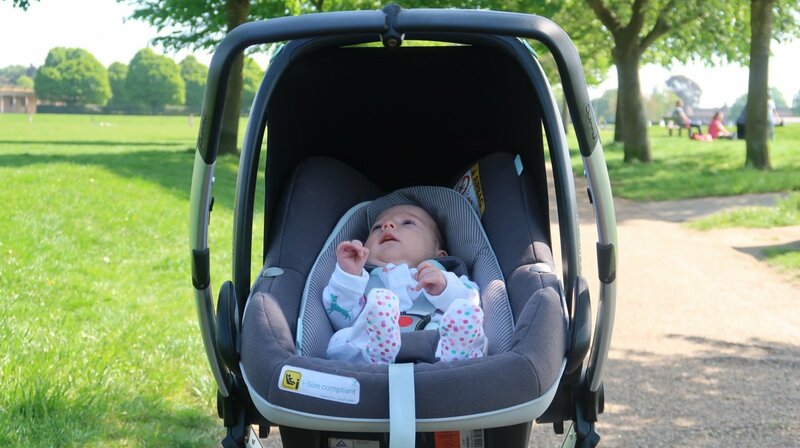 The only downside for the Quinny Zapp Flex Plus is that isn’t particularly light. But at 10.3kg, it still weighs less than my just-two year old! 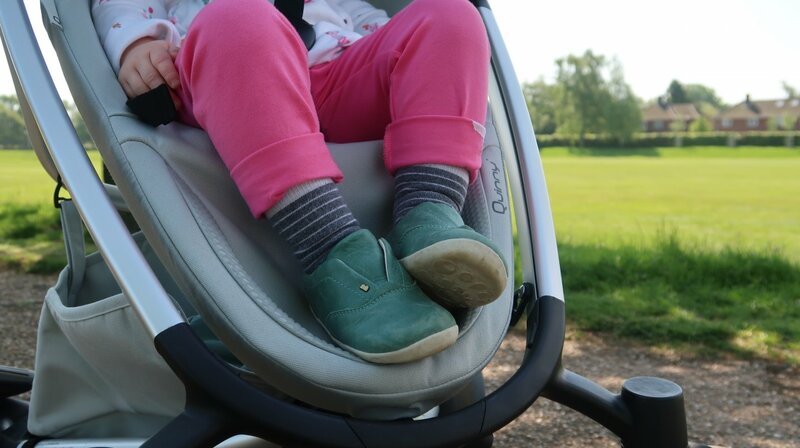 The Quinny has a lovely deep seat and a high back, which can be positioned parent- or world-facing. I think it will be great for M as she grows. The Quinny will really come into its own for our family, though, when B reaches six months and is able to use the seat unit. I’m sure that in another four months’ time, M will be walking even further and have even less desire to be in the pram. The Quinny Zapp Flex Plus will be an ideal, boot-space-saving choice for us! 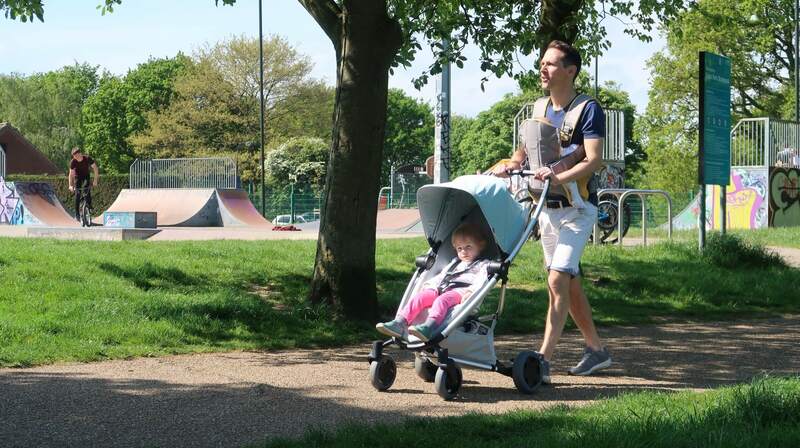 The Quinny Zapp Flex Plus has an RRP of £335. Disclosure: We were sent the Quinny Zapp Flex Plus free of charge in order to write this review. However, all opinions are my own.